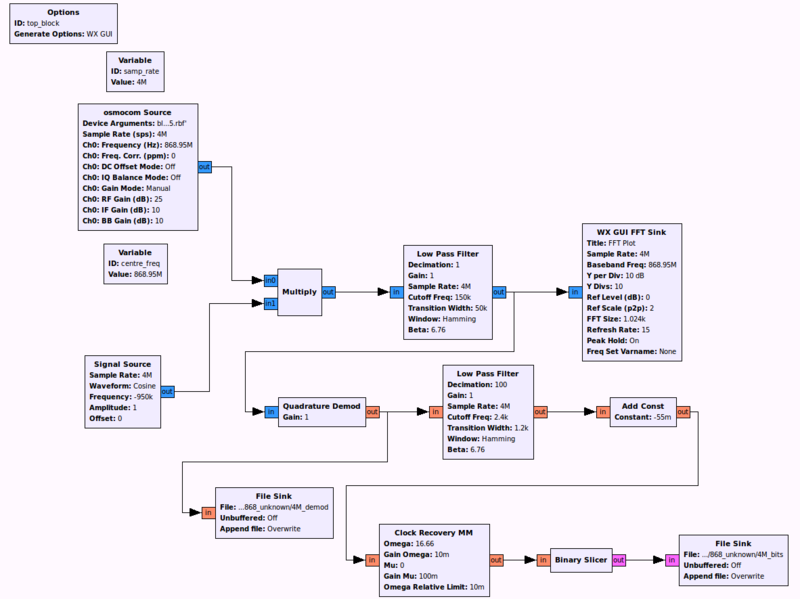 When you first start GNU Radio Companion, you are presented with an Options block and a Variable block. 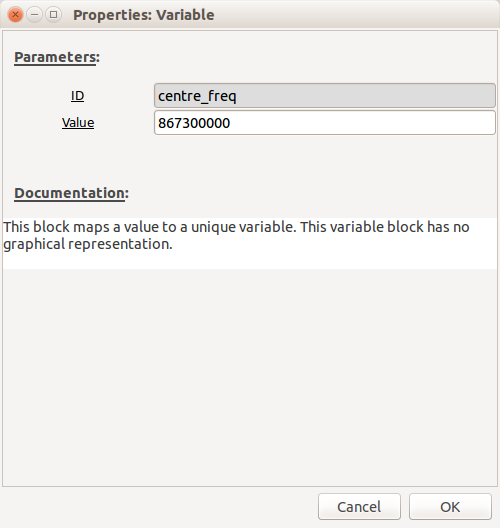 The Options block allows you to enter parameters such as the Title, Author, Description and also allows you to decide if the GUI elements will use the WX or QT environments (WX is the default). Depending on which SDR you have will depend on which options you set here. All of the main receivers can be controlled using the "osmocom Source". The "Device Arguments" settings for different SDRs can be found here. 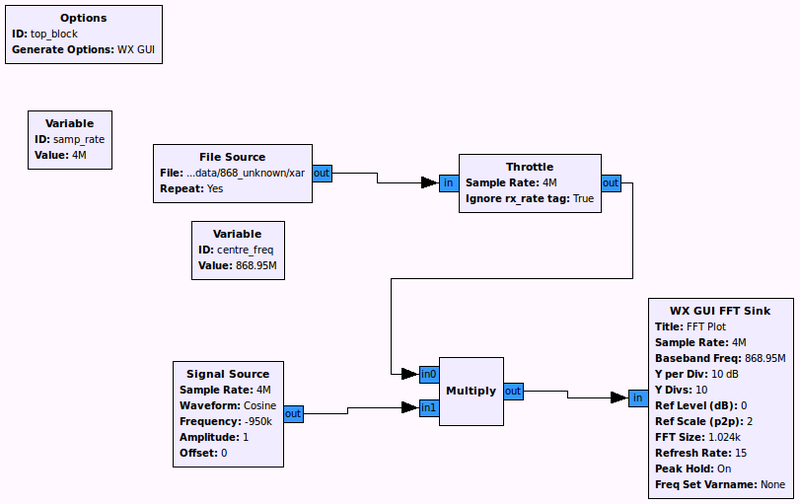 However, if you are using an RTL-SDR, you can also just use the "RTL-SDR Source". The sample rate will already be pre-populated with the "samp_rate" variable. Set "Ch0: Frequency" to be "centre_freq" and then create a new variable called "centre_freq" with a value near your target carrier frequency. Leave everything else at the defaults. 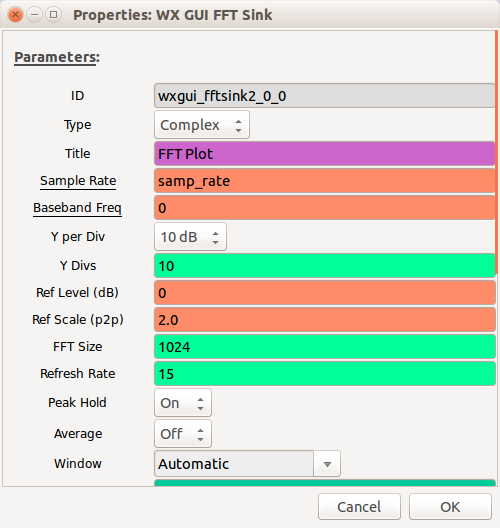 Select a "WX GUI FFT Sink" and connect it to the output of the receiver by clicking on the receiver output and then clicking on the "WX GUI FFT Sink" input - an arrow will link them together (if you want to unlink two blocks, click on the link and drag - it will disappear). Note: By default the inputs and outputs are blue on these blocks, this denotes the type (blue = complex data, orange = float etc.) If the colours do not match on the connecters you are trying to connect together you will get a type-mismatch error and the arrow will go red. I have no idea what this signal is, but thought it would be a great opportunity to test out my methodology against, so the remainder of this receiver development example is based on this signal. Looking at the frequency, it is around 1Mhz higher than my centre frequency, so about 868.3MHz. The flow-graph can be stopped by closing the FFT window. 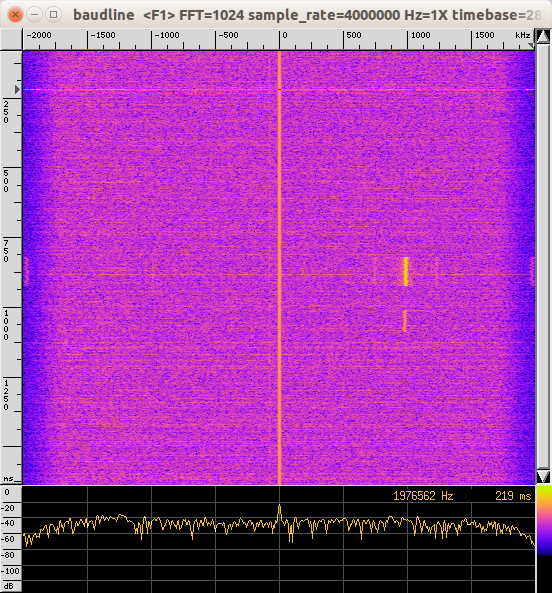 So far we know that there is a signal (which happens to be repeating periodically) at around 868.3MHz, but we have no idea about what that signal is. The next stage is to save it to a file so we can do some post-processing. 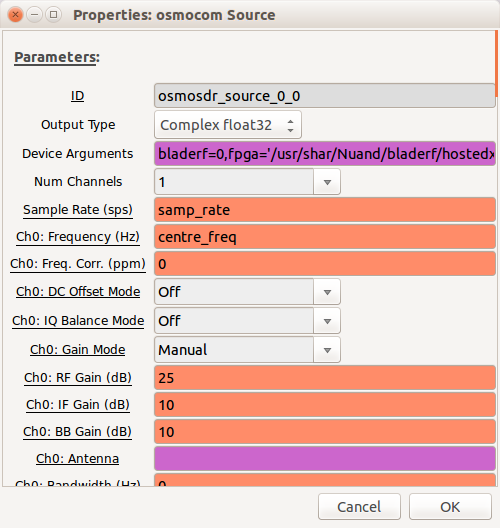 Add a "File Sink" and connect it to the output of the "osmocom Source". Set the filename to something sensible - I always include the sample rate within the filename, so use something like "4M_received_baseband". 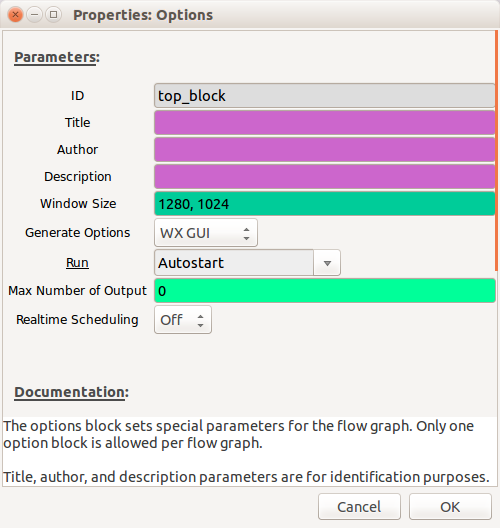 Restart the flow-graph by clicking on the gears icon and record enough data so that it includes the signal of interest. Note: SDRs generate very large amounts of data - a recording lasting only a few seconds can result in many tens of megabytes of data, so experiment first! This should result in a series of files called "parta, partb, partc etc." Right-click to open the main menu -> input -> open file. Make sure you select your "partx" file rather than "4M_received_baseband". Sample rate: "Custom - 4000000"
Tick "quadrature" and "flip complex"
The file will be displayed graphically with time vertically and frequencies displayed horizontally. 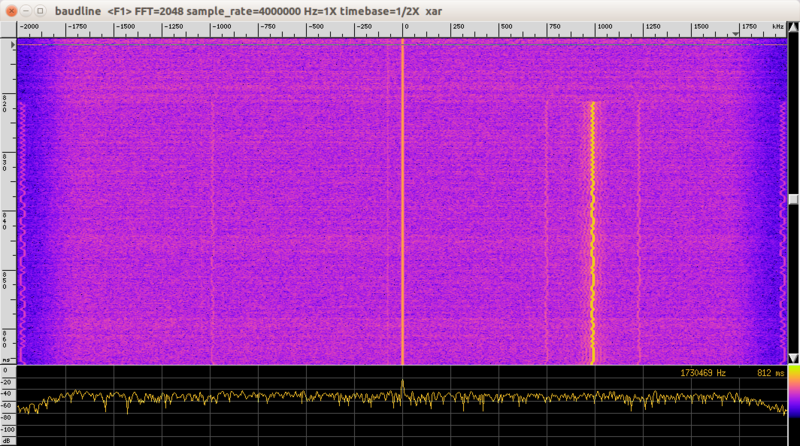 If you look carefully at the output, you can see a squiggly yellow line - that is the signal! You can zoom in and out of the time domain using Alt-up arrow and Alt-down arrow. If you want more detail in the frequency domain you need to change the FFT "bin size" (main menu -> process -> transform size). 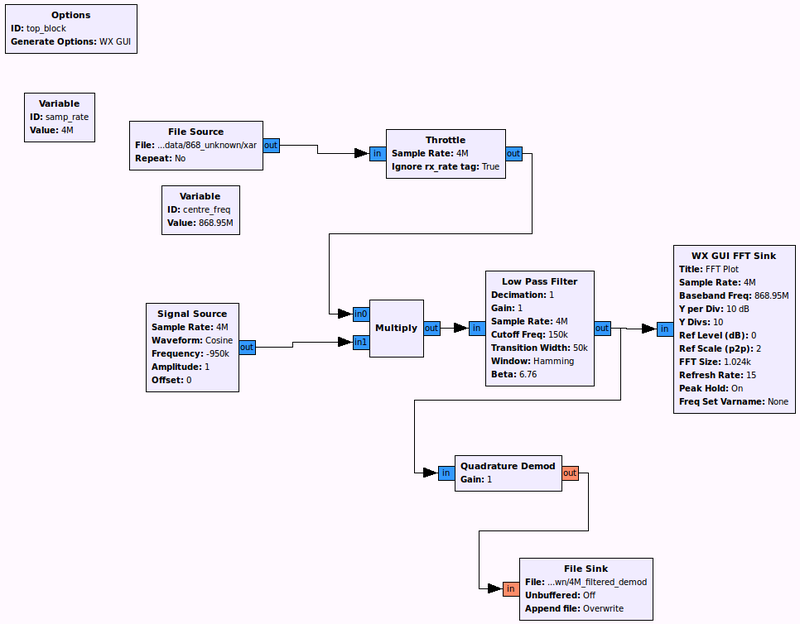 Going back to GNU Radio companion, we now need do some more processing to make sure the signal is centered. First, replace the receiver with a "File Source" block that will replay the "partx" file that contains the signal. Also, set the file repeat to "Yes". Next, add a "Throttle" block after the "File Source", so that we don't overwhelm the CPU on the PC running GNU Radio Companion. 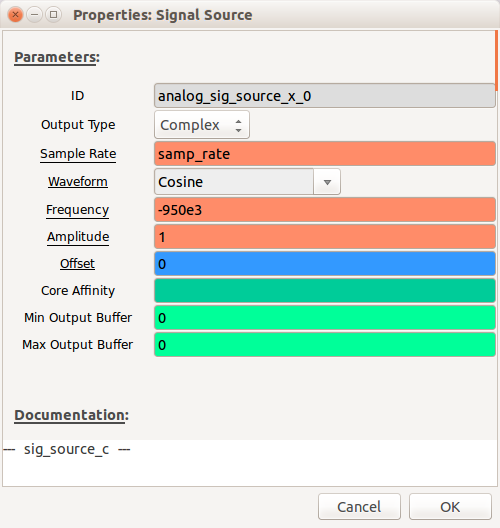 We now want to focus in on the signal of interest and filter out any other signals present in the baseband we have recorded. Add a "Low Pass Filter" block between the "Multiply" block output and the "WX GUI FFT Sink" input. 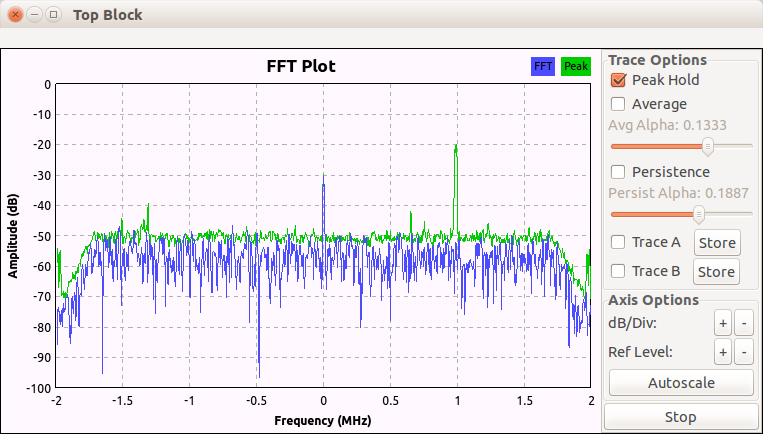 Set "Transition Width" to 50e3 - this is the bandwidth over which the filter will act i.e. the smaller the number the more aggressive the filter. We are making the assumption that based on the output we observed in Baudline, the modulation scheme is FSK (to be precise, "2-FSK" or "Binary FSK" where the frequency is shifted one way for a "0" and the other for a "1"). 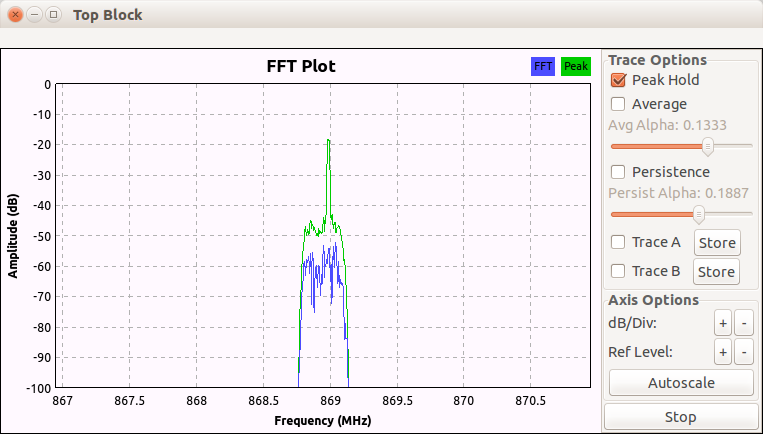 Therefore, we need to add an FSK demodulator - there are many different modulators available within GNU Radio Companion, but the one we want is the "Quadrature Demod". Add a "Quadrature Demod" and set the "Gain" to be 1. 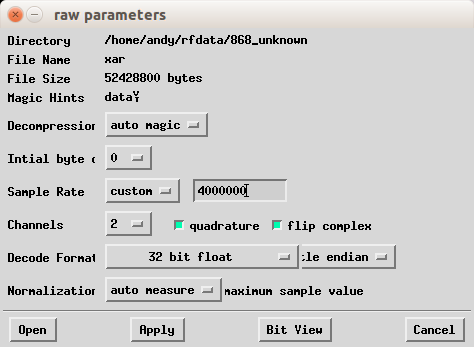 Add a "File Sink" and set its input type to be "float" (orange coloured) and set the filename to be something like "4M_filtered_demod"
Connect the output of the "Low Pass Filter" to the input of the "Quadrature Demod"
Connect the output of the "Quadrature Demod" to the input of the "File Sink"
In "File Source" set "Repeat to "No"
Run the flow-graph and it will produce a file that hopefully will contain demodulated data. 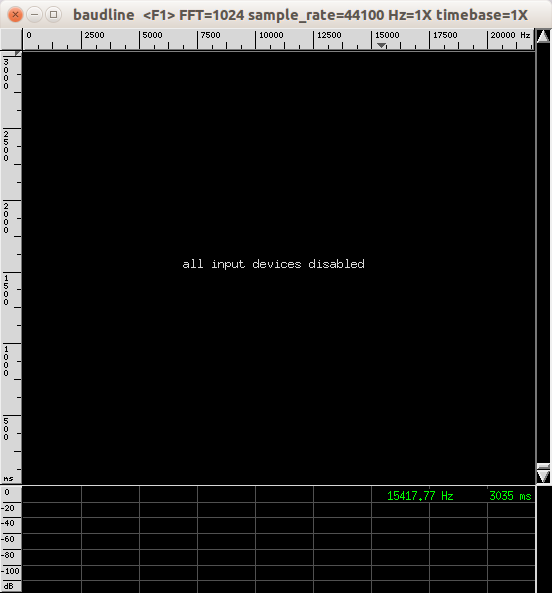 We should now have a demodulated file that can be loaded into Baudline. Note: Remember, if your "4M_filtered_demod" file is larger than 50Mb then you will need to split it into chunks again. These are the data bits represented by the original "squiggly line" we saw in Baudline when we looked at the complex baseband signal. 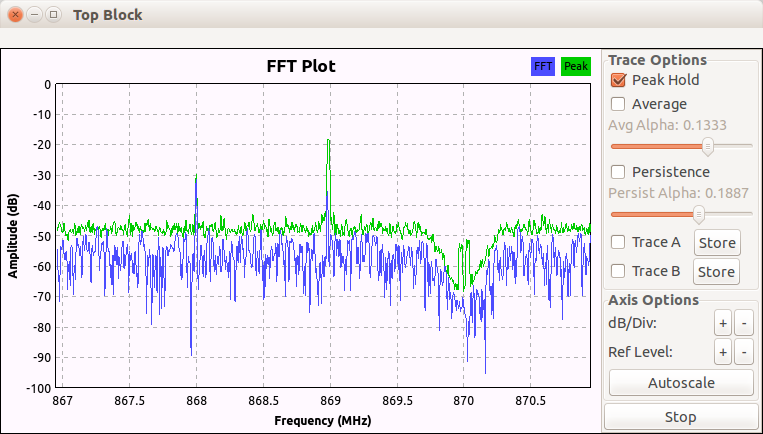 It also confirms that the data was modulated using 2-FSK. As we can see from the signal, it still looks very noisy, so we need to do some further, more accurate filtering and in order to do this we need to estimate the Baud rate (the number of symbols per second), but first we need to discuss how the data is represented. It looks like the peak represents a "1" and a trough for a "0", however it's not quite as simple as that; it is in fact encoded using something called "Manchester encoding". Manchester encoding is what is known as a "line code" and ensures frequent voltage transitions, directly proportional to the clock rate, which helps clock recovery. What this actually means is that a "0" is represented by a transition to low and a "1" is represented by a transition to high. The sample rate is currently 4,000,000 and the Baud rate is 2400, so if we divide 4,000,000 by 2400 we get the number of samples per symbol - 1666! 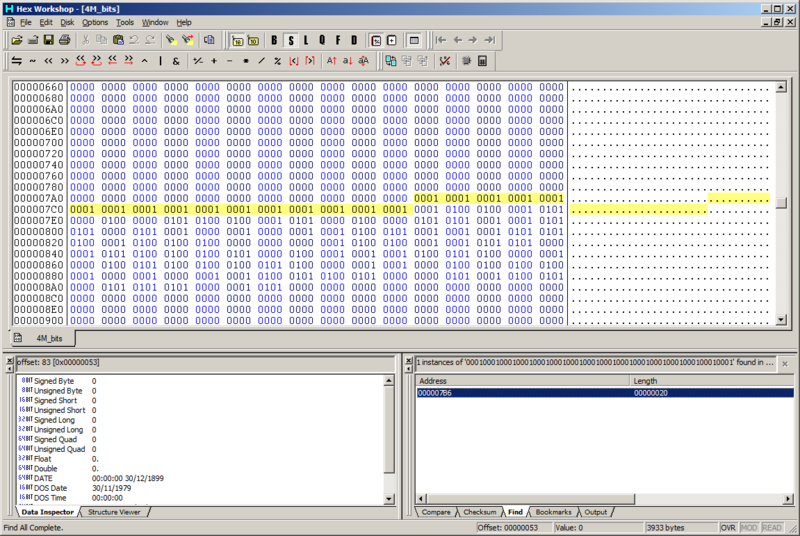 That's why it's running slowly... we don't need anywhere near 1666 samples to represent each bit. We're not quite ready to recover the bits yet though, as the signal should be alternating about 0dBm (the centre line in the waveform view. It's actually up towards +90dBm, so it needs to be reduced. If you're interested in what these values mean then read "Timing Recovery in Digital Synchronous Data Receivers" by Mueller and Muller. The final value we need is "Omega" - this is the number of samples per symbol. We previously calculated this to be 1666 and so decimated the signal by a factor of 100 so "Omega" now needs to be set to 16.66 (1666 / 100). Add a "File Sink" to the output of the "Binary Slicer" - you'll need to set the input type of the "File Sink" to "Byte" (pink coloured). 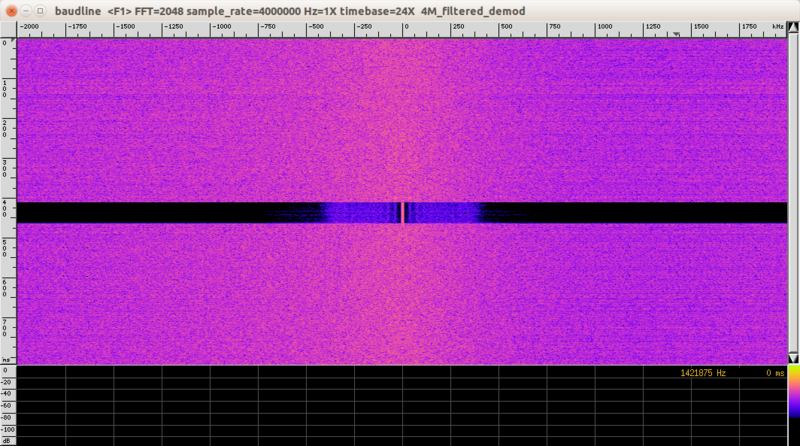 Set the filename to be something like "bitfile"
You have now successfully retrieved the data from an RF transmission! I still have no idea what this signal actually originates from - maybe one of my neighbours has an automatic garage door, or it could be a wireless central heating controller or some other IoT device.